It’s the holidays, and regardless of whether you’re headed to grandma’s house for a turkey dinner with the family or off on a mini-vacation with your own family, you want to go in something that offers you plenty of room and great fuel efficiency. The 2017 Toyota RAV4 Hybrid offers both of these features. Travelling is made easier when there is plenty of room for you, your family and friends and all of your cargo. The 2017 RAV4 is equipped with spacious seating and room for five. You and your passengers will like the dynamic contours and contrasting trim on seats that Toyota engineered for support and comfort during long trips. Toyota made it really comfy for the driver by making the driver’s seat adjustable by eight ways including Lumbar support adjustments. By being able to change the way you sit while driving long distances, shifting positions may ease any muscle aches or tiredness. Toyota even made it easy for you to carry your coffee with you by installing specially designed cup holders that will hold regular large coffees or mugs with handles. 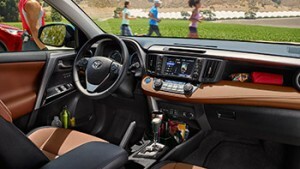 The Limited model offers a Driver Seat Memory System that remembers your seating preferences, so if you have someone else drive your RAV4, you can easily get the seat back to where it is the right fit for you. As soon as the temperatures really start to drop, you will like the fact that Toyota made the front bucket seats heated as part of the RAV4’s standard equipment. The rear passengers can be just as comfortable with their adjustable, reclining rear seats and 944.9mm of legroom. Dual climate control lets those in the back set their own comfort level without making it uncomfortable for those in the front seats. The rear seats are a 60/40 split that lets you lay them down for more cargo room. When Toyota designed the cargo area, they installed a number of small pockets and other compartments that let you put your smaller items in a safe place. A tonneau cover helps further protect your valuables. You’ll love the easy-to-use liftgate that opens up to provide full access to the cargo area. The SE model has one-touch power and the ability to remember a number of height settings should you ever need to adjust the height settings for the gate. The Limited model makes loading even easier with a no-touch system. When your arms are loaded down with gear or groceries, just wave your foot under the gate, and it will open for you. You don’t have to set a thing down. The 2017 Toyota RAV4 Hybrid is the most fuel efficient SUV in Canada according to fuel efficiency estimates determined by using approved Government of Canada Test Methods. All three models get 6.9/7.8(city/highway) L/100km. Toyota equipped all the models with a 2.5-litre DOHC 16 valve 4-cylinder 194 horsepower engine. The hybrid system in the RAV4 comes with a battery that is made to last the life of the vehicle. Toyota has had hybrids on the road since 2001 that have never needed to have their batteries replaced, so they’re very confident in the product. Nonetheless, they do have an 8-year/160,000km warranty on their batteries. It costs less to own a RAV4 Hybrid in more ways than saving at the fuel pump. With no starters, alternators or belts to replace, the maintenance costs are lower. The brakes are regenerative, and since the engine isn’t needed during battery power, it is subject to less wear and tear. The 2017 Toyota RAV4 Hybrid is a stylish SUV that comes in seven colours. Come by today, and take one out for a test drive. We think you’ll be impressed.